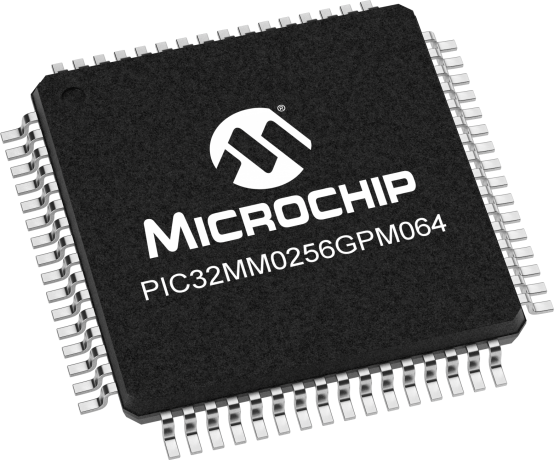 The eXtreme low power PIC32MM GPM family extends Microchip's lowest power and most cost-effective family of 32-bit PIC32 microcontrollers by adding USB and ECC memory up to 256KB. The PIC32MM GPM family provides a smooth upward migration path to the PIC32MM GPL family customers who want more memory and pins while also providing a cost-effective migration path for customers who need higher performance and lower power in compact packages as small as 4x4mm. Supported by the popular MPLAB Code Configurator (MCC) tool, setting up pin assignments, peripheral modes and application stacks have never been easier helping customers bring their design to the market faster than ever before. The PIC32MM0256GPM064 Plug-in Module(PIM) is designed to plug into the Explorer 16/32 Development Boards and is designed to enable users to explore the innovative features and capabilities of the eXtreme low-power PIC32MM “GPM” family. The PIM includes the PIC32MM0256GPM064 64-pin TQFP device, which has the most memory and highest pin-count of all devices in this family.